Nemesis Watch Inc. introduces the latest design from watch designers and drives the watch market to a whole new generation. For over ten years, Nemesis watch Inc. has been an international leading force in the design and manufacture of Leather Cuff Watches. We commit to provide our customers with the highest quality design for the lowest prices as possible. Our watches are all manufactured in the United States with extra attention paid to choosing the best products, such as genuine leather and intricate detailing and clockwork. Our professional team assembles all the watches in the United States with a focus on accuracy and precision. Our Free-Style, Street-Wear watches come with the choice of many wide bands. Our consumers can play around with one watch style and interchange it with a variety of leather bands making watch wearing so much fun!! Nemesis Watch Inc. introduces the latest design from watch designers and drives the watch market to a whole new generation. For over ten years, Nemesis watch Inc. has been an international leading force in the design and manufacture of Leather Cuff Watches. We commit to provide our customers with the highest quality design for the lowest prices as possible. Our watches are all manufactured in the United States with extra attention paid to choosing the best products, such as genuine leather and intricate detailing and clockwork. Our professional team assembles all the watches in the United States with a focus on accuracy and precision. Our Free-Style, Street-Wear watches come with the choice of many wide bands. Our consumers can play around with one watch style and interchange it with a variety of leather bands making watch wearing so much fun! 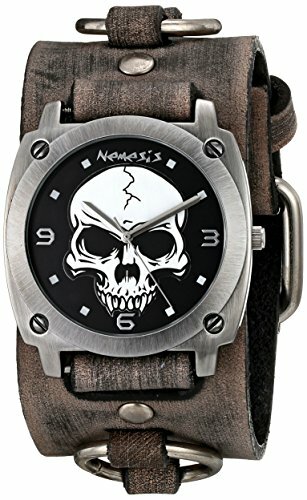 !Nemesis Men's Punk Rock Black Heavy Duty Skull Leather Cuff Watch features silver tone case with four screws and 100% USA genuine black leather band with metals studs and iron skulls on the side. This Punk Rock Nemesis Watch also features a round glass display with white skull over black dial that has a water resistance up to 3 ATM / 30 meters / 99 feet and a Japanese quartz movement technology.